You know when you are half Chinese and like people don't know your Chinese, you get some funny questions right? Like when they first find out your Chinese. Even the benign stuff that's just out of curiosity. I remember in High school we were practicing Basketball and this guy is like, "Oh so you're half Chinese, so like you know how to make Crab Rangoon?" And to be honest....I didn't know what the hell Crab Rangoon was. I never heard of it. But this guy was a Crab Rangoon fiend. "Awe man I love that stuff, i's awesome. I eat that every time I go to a Chinese restaurant." 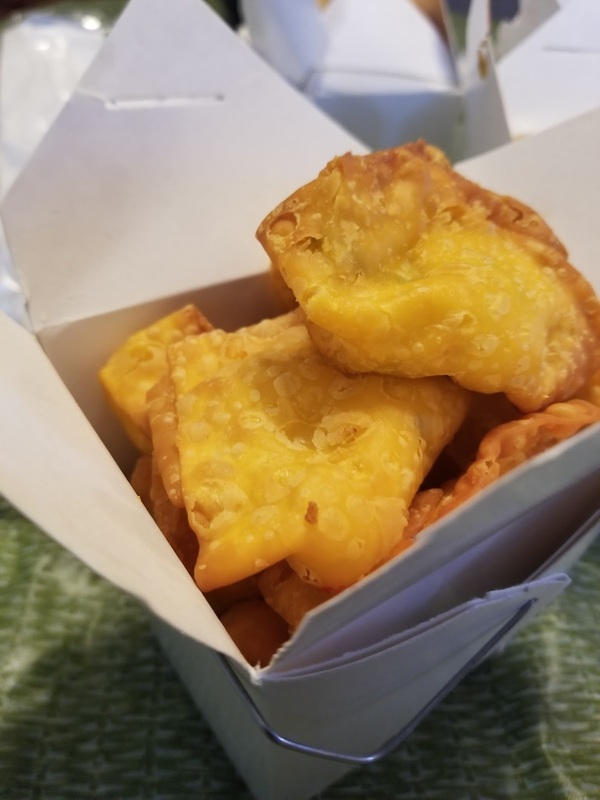 So funny thing is, the first time I would really be introduced to Crab Rangoon was later that same year, when I worked at an American Chinese restaurant for Chinese New Years. I got a ride to some god awful place in the middle of Massachusetts with a group of older men who talked about da fei gei the whole time there. And then for four hours or so I folded these scoops of cream cheese with strips of pink stuff (which I would later learn was artificial crab) into these wanton squares. The next day was the New Year's rush, throwing together orders yelling back and forth in Chinese (just numbers really) and working on my teet sa jerng by picking up the chicken fingers or wings or those weird yellow triangle things and putting them into boxes. Yeah if we dropped it on the floor, we put it right back into box. In retrospect I probably shouldn't have done that. After the rush there was down time and we all ate together. Bitter melon and pai gwut, cleansing soup to get rid of yeet hei, and some people took one or two pieces of the super American style Chinese food to go along with their meal. "Hey Gwai Jai, I thought your people all like Hai gok! How come you aren't eating it?" One chef said in Chinese. "What is Hai gok?" I asked. "Hai Gok is that stuff you have been folding for four hours... here, let me get you one. Yes, Hai Gok... is Crab Rangoon. I guess the direct translation is a crab corner. I bit into it and was like "What the hell is this? And spit it out. Now since then, I have had homemade Crab rangoon with duck sauce and stuff that tasted good to me. It might just be that it is a required taste... because when you think Chinese food you just aren't expecting Cream Cheese. I have always thought that the Crab Rangoon, the cream Cheese would actually work really well as a dessert, like glazed in Honey or something. But that along with Chicken wings and beef teriyaki is the go to for many Americans on News Years Eve. My wife really wants to order this type of food for our New Year's eve part. The greasier the better. It's as American as Cookies and Milk for Santa Claus. A tradition forged in the Chinese restaurants being the only thing open in the past.... and now it is simply ingrained into our national consciousness. I mean Chinese American food, the greasy stuff, the stuff to the American taste, the pre hipster American taste. Has its place. It is like the emergency food. The food that Sonny and Michael Corleone ate while meeting with Clemenza about how to Assassinate the Turk and the Dirty cop. Its like, if Italians are eating Chinese Take out BEFORE going to a sit down family Italian restaurant... then something is up. For Jewish Americans Chinese food, fancy style has been the traditional food to eat on December 25th. But now as family norms change and tastes change and Bourdain influences us, the mainstream American tongue craves the "authentic" Chinese food. The stuff that the cooks were making for themselves after the New Year's rush. But come December 31st, out of homage to our past New Year's eves, we will raise a glass of Champagne or some sort of alcohol, count down, and most likely Chow down, an the Chinese food that Chinese Americans and Millennials often turn their nose up at any other time of year.... because it's a tradition, and American Tradition.